A radio host begins to believe that shadows are capable of killing people in their sleep after his show is implicated in a mysterious death. Cambodia, 1979 – A boy named Teng hears an elder villager tell tales of dark figures that attack people who then die in their sleep. That night, the boy has similar visions. Eastern Kentucky, 2008 – Charlie “Crowe” Camfield hosts “Night Shift,” a late night radio talk show on Z104 KZTO. His producer is Tom DiMartino. Charlie takes a call from a teen named Jeff Hyatt who claims he is being stalked by shadows. Charlie hangs up on him and ends the show. Charlie drinks at a local bar owned by Jim “Sparky” Taylor. Charlie’s ex-wife Ellen drops off their son Preston for the weekend. Charlie lives a disheveled bachelor’s life and has a strained relationship with his son. The next day, Charlie finds an envelope from Jeff left on his doorstep. It contains documentation about Shadow People and SUNDS (Sudden Unexpected Nocturnal Death Syndrome). Papers in the envelope reference Doctor Aleister Ravenscroft and a Camden College sleep study about subjects who claim to see shadowy figures. On that night’s radio show, Jeff calls again and tells Charlie he is afraid to fall asleep. He cannot escape the Shadow People because they are drawn to thoughts and he cannot stop thinking about them. A gunshot is heard and the phone call ends. It is later discovered that Jeff only shot the wall and he was then checked into a hospital. The local news takes an interest in Charlie’s show after the incident. Tom convinces Charlie to meet with Jeff at the hospital as good PR. When he arrives, Charlie learns from a nurse that Jeff died in his sleep of unknown causes. Charlie goes to the library at Camden College to research Dr. Ravenscroft and the sleep study. The student librarian, Maggie, tells him only faculty and students can use the reference materials and copier, but she makes an exception when she realizes who Charlie is. After Charlie leaves, Maggie discovers what he was researching when she removes a paper jam from the copier. Maggie starts doing her own research on Shadow People and begins to think she is being stalked by the darkness. That night, she experiences sleep paralysis and is killed by a shadow. Charlie learns of Maggie’s death from the morning paper. His radio show continues to grow in popularity, but Charlie starts seeing shadows himself. Dr. Sophie Lacombe, MD, MPH is an Epidemic Intelligence Officer with the CDC. She is assigned to investigate the two mysterious deaths of Jeff and Maggie. She visits Charlie and he tells her about Ravenscroft. Sophie meets with Professor Norman Fisher at Camden College. Fisher tells her that Ravenscroft is buried in Resurrection Cemetery. Ravenscroft believed that mind could influence matter. He wired subjects to a door and had them all concentrate on opening it with mental power in a state between sleep and waking, but all of them died. Ravenscroft’s notes were reportedly destroyed. Meanwhile, Charlie’s visions escalate. Charlie learns Preston still listens to his radio show after another visit from his ex-wife. That night, the nurse that Charlie met at the hospital dies in her sleep after being paralyzed by a shadow. Sophie learns from Ravenscroft’s death certificate that he was cremated. She arranges for an exhumation of his grave to see what is buried there and finds a film reel. The film reel is of Sleep Study GR16 1971. Charlie plans to show it to the news as proof that the Shadow People exist. He also removes all of the furniture from his house, just as Ravenscroft reportedly did, so that nothing can create a shadow. Sophie realizes that the Shadow People gain their power from a placebo effect of people believing in them. She pleads with Charlie not to show the film on his television appearance as it will lead to more believers who will then die. While live on the air, Charlie decides not to show the film and instead claims that everything has been a hoax. Charlie ends up with a job mopping floors at Sparky’s bar. Preston later finds the Sleep Study video transfer and uploads it to YouTube. A shadow hand reaches from the darkness and grabs Preston. “Shadow People” has the germ of an interesting idea at its core. An idea that might even make for a compelling horror film. Sadly, this movie is not it. Radio host Charlie “Crowe” Camfield receives a call on his talk show one night from a frazzled boy named Jeff. Jeff is afraid to fall asleep because he sees Shadow People, mysterious spirits that paralyze and suffocate you in your bed if you believe in them. After Jeff suffers an unexplained death in his sleep, Charlie begins an investigation that leads him to wonder if Jeff may have been telling the truth. Based on a “true phenomenon,” “Shadow People” additionally purports to have been inspired by a viral video known as “Sleep Study GR16 1971,” as well as authentic cultural beliefs that Shadow People are to blame for Sudden Unexplained Nocturnal Death Syndrome (SUNDS). The filmmakers come close to pulling off their ruse, and might have done so were it not for a few hiccups. The first being naming the research professor Dr. Aleister Ravenscroft, which is a name so sinister that it immediately betrays the conceit this could be a true story. The movie might have been more effective as a thriller had it just completely made up something more interesting. Because it turns out that Shadow People are really not very frightening. Most people have probably seen a strange flicker out of the corner of an eye while falling asleep on occasion. I have. But I never thought that shadow might be a malevolent entity out to kill me in my sleep. That could be an interesting premise, except the Shadow People are presented without any meat to their mythology. Who/what are the Shadow People? From where do they come? What do they want? Well, one of them reportedly wears a hat. And that is the full extent to which any personality is ascribed. As depicted in the film, Shadow People are pretty much just an indistinguishable darkness appearing for a second or two. Whoever sees them is unable to move and then someone finds that person dead the next morning. That is it. Three people dying offscreen in their beds does not make for an exciting movie. Even though “Shadow People” seems like it is leading to something revelatory, it ultimately does not. The Wikipedia entry for SUNDS includes mention of a creature called a batibat, a fat hag that “sits on the victim’s face or chest so as to immobilize and suffocate him.” There is also a claim that superstitious Laotian men believe SUNDS is caused by the spirit of a jealous woman. These men go so far as to dress as women when they sleep just to fool the dab tsuam (malign spirit). When Wikipedia has better story ideas for what to do with SUNDS, that is a sign of trouble. For all we know, these people swallowed spiders in their sleep and were either poisoned or choked to death. Snopes tells me the statistic that an average person swallows eight spiders per year while sleeping is an urban legend. The Mikkelsons are generally reliable and I might be inclined to believe this had I not woken up with a lump in my throat one morning and coughed up a giant dead spider. True story. It might even make for a scarier premise than dying in your sleep after seeing a shadow. “Shadow People” uses a framing device similar to “The Fourth Kind.” In addition to the movie being billed as a dramatization of true events, the “true events” themselves are also shown. Scenes are split-screened or intercut with “actual” footage of the events depicted or with interviews from the people the actors are portraying. The result is stunningly convincing. 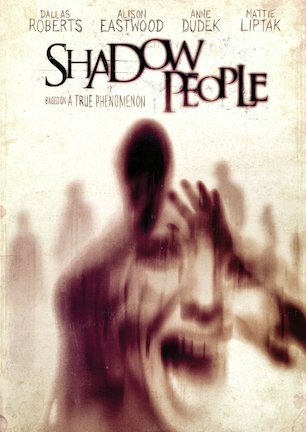 Yet despite how well the mockumentary format works within the film, an opportunity was missed to fully develop the Shadow People mythology outside the screen. In this post “Blair Witch” age of viral marketing campaigns, there is disappointment that “Shadow People” did not go the whole nine yards to sell its “true story” angle in the real world. It may seem unfair to offer criticism that is not directed at the movie itself. After all, what happens to promote it afterwards is generally the responsibility of Marketing and PR. However, when the fantasy of a film requires belief that certain events actually happened, there is no way around the fact that some sort of effort must take place offscreen. A title card claims the film is based on a viral video known as “Sleep Study GR16 1971.” Naturally, I searched YouTube for videos with that label and found one post from March 21, 2011. On March 21, 2013, two full years later, I was only the 1,049th view. That hit counter will undoubtedly see a significant spike once the home video drop goes wider (UPDATE: That number is 135,458 as of June 3rd, 2015), but it is still a far distance from the six figure number displayed in the movie for the same URL. It certainly does not fuel the notion that interest in this supposed phenomenon is spreading like wildfire. As of this writing, which is about one week before the DVD/Blu-ray release, a Google search for any of the principal names featured in the film, including “Aleister Ravenscroft,” “Charlie Crowe Camfield,” and “Sophie Lacombe,” yields zero results related to “Shadow People” in the top positions. With website hosting readily available on the cheap, someone should have spent $40 to put up a couple of phony pages, at least for the first month of release. Although the movie is not scary, the structure of the film is fantastic and incredibly well executed. Some of the “actual footage” used seems to be culled from a real documentary while the rest is from something called, “The Shot Heard Round the Web” (another set of terms that return nothing when entered in Google). I do not know what the real source is, but every clip oozed authenticity. If only the narrative technique had been employed on a better story. Hopefully director Matthew Arnold will apply this aptitude to a full “found footage” horror film on his next go, and leave the Shadow People to Cambodian campfire tales. NOTE: "Shadow People" was previously known by the title "The Door." March 21, 2013 by Ian Sedensky.